A really fun idea for a group at Halloween is to dress up in The Village People Costumes. This is definitely one of the more popular and fun group costume ideas! I don’t know what it is about these outfits. but on the few occasions that I’ve seen people dress up as The Village People it’s always brought a smile to my face and I know I’m not the only one affected in that way. So who were the Village People? A group known for bringing earwig songs into the charts such as the eternal YMCA as well as Macho Man & In The Navy. This colorful American disco group dressed up as a native American, soldier (sometimes a member of the navy instead), a cop, a construction worker, a cowboy and a biker/leatherman. Yeeha – This is a Fun Village People Costume! The cowboy outfit hasn’t changed that much over the years despite different people ‘playing the role’, one thing to remember though is that The Village People were formed in the 70s which means that with this costume you should also add a moustache that Ron Burgundy would be proud of! 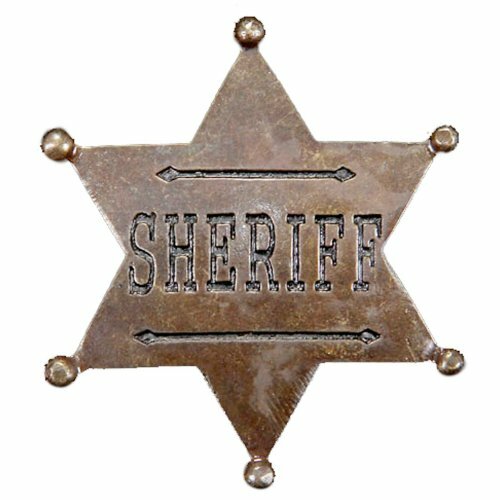 This costume includes the waistcoat, chaps, neckerchief and hat which means that you’ll have to supply the sheriff’s badge, jeans, boots, moustache and shirt. Below you’ll find a perfect moustache for jolting you straight back to the seventies, absolutely perfect for wearing when you’re singing YMCA! I’ve sourced a checked flannel shirt for you to add to the costume, but you could use any casual shirt that’s in your wardrobe. I just don’t think you can beat the old checked flannel shirt for a cool cowboy costume though. This is an officially licensed costume that is ‘supposed’ to be based on the native American costume that’s worn by a member of the Village People, however it’s quite different from the one I remember from YMCA days. The one I remember wore jeans and a suede fringed jacket (very 70s frontierman look!) along with the headdress, war paint and cool boots. This costume includes the headdress, loincloth, chestplate and boot covers. If you want to you could wear this and when you’re with the other members of the group you’ll still be recognizable as members of The Village People. As different people came and went in the group the costumes changed a few times as well. 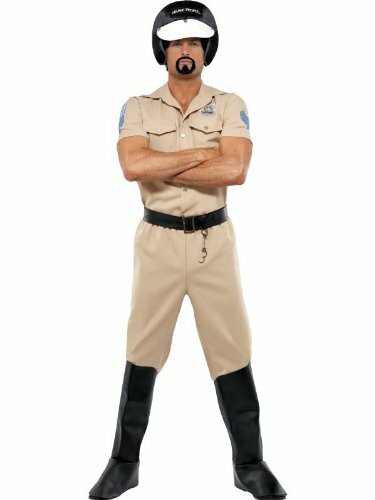 This officially licensed Village People costume is based on the original highway patrol uniform that was worn, but a blue police uniform has also been worn at times over the years so if you have a different police uniform on hand feel free to wear it instead. This official costume includes the shirt, trousers, boot covers, helmet and belt which is all you really need. If you want to add a little extra then a black pleather jacket would be good along with a pair of handcuffs hanging off of the belt. You also want to make sure you have a few shirt buttons undone (it was the 70s, the decade of men baring chest hair …..) and add a few dangling gold chains. One of the More Popular of The Village People Costumes! This official costume includes the chaps, top, hat and even harness (well not a ‘real’ one, just a plastic one that looks like the real deal!). All you’ll need to add is a pair of jeans or trousers, your disco dancing boots and the most important thing a very 70s moustache! Not only is this an officially licensed costume it even says ‘The Village People’ on the hat – just in case anyone couldn’t identify you! 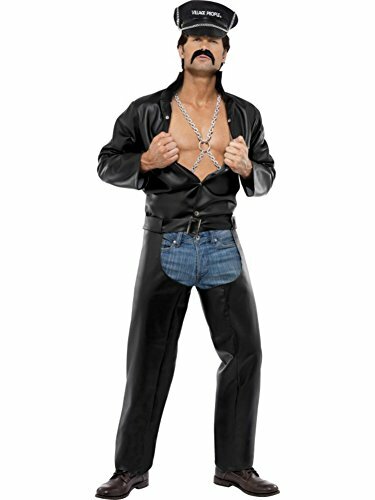 This costume set includes the shirt, belt, hat and sunglasses so that all you need to do is harmonize with the rest of the group, think of the words to the song Macho Man to get yourself in the zone and you’ll be halfway there. All you need to add is jeans, boots and let’s not forget a cool looking 70s mo! When I think of the Village People I always envisage a soldier in the ranks (probably because of the YMCA video), but the soldier was often replaced by a naval man. 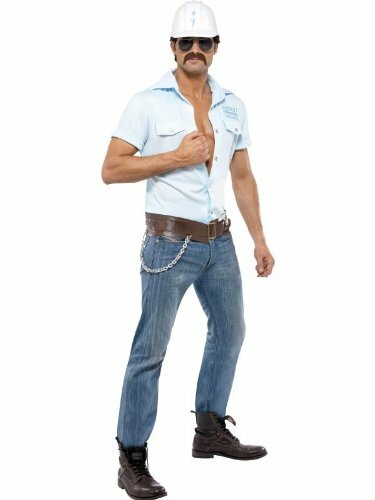 The costume below is an officially licensed Village People costume, but they’ve also had someone who was dressed more like an officer on some occasion. 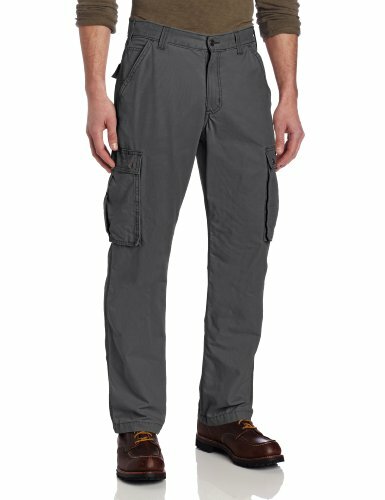 This outfit includes the top, trousers and hat which is all you really need to be one sixth of The Village People. 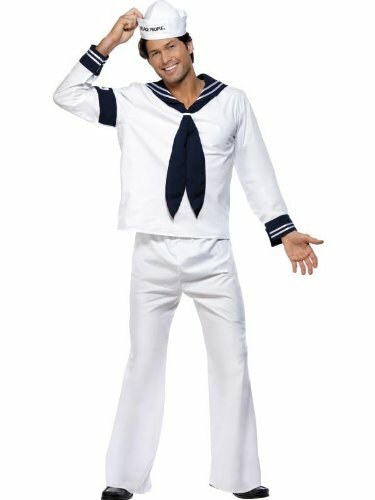 If you don’t like the navy costume for whatever reason, or you just happen to have some fatigues lying around then why not dress up as a soldier instead? If you don’t have the gear then take these items below and team them with a pair of lace up black boots and the words to a few songs (better skip In The Navy though as it might not seem quite right) and join the rest of your group for a great night out. Do You Have YMCA Stuck in Your Head Now? I must admit I wasn’t a fan of YMCA, but whenever I heard it I couldn’t get it out of my head. I hadn’t heard it for a few years until my daughter’s first school disco in primary school when the organizers decided to infiltrate our kid’s heads with this earwig song. If you haven’t heard of the expression earwig song it basically means a song that gets stuck in your head and won’t get out. Now there is a cure, but unfortunately that cure has a side effect…….. simply start humming The Birdie Song and it’ll get rid of any earwig song you have – the side effect is that you’re often left with The Birdie Song stuck in there instead! These days I don’t mind hearing the song as I get a touch nostalgic when it’s played ….. and I remember how cute it was watching my daughter dance to it!! Get Yourself in the Mood! Get yourself in the mood with the original music video as you’re getting ready to go out…….. even if you’ve decided NOT to dress up as the Village People I’m sure you want to listen to the song again don’t you? This entry was posted in Costumes and tagged fun 70s costumes, group costume ideas, music themed costumes, the village people costumes by Lou. Bookmark the permalink.